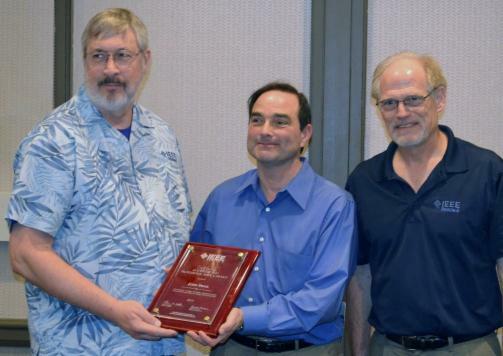 In 2015 John was Awarded the Outstanding Leadership and Professional Service Award (plaque here) by IEEE Region 6 – the Western 11 states of the U.S.
(left) Mike Andrews, previous R6 Director, (center) John Swan, (right) Tom Coughlin*, current R6 Director. Photo credits: Doug Askegard. At R4 & R6 officer and leader training, 1/25/15. 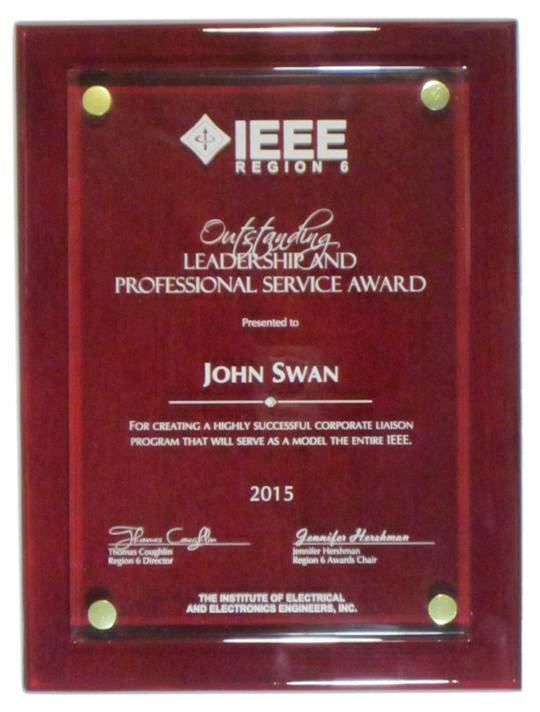 ....or as the Award plaque says, "For creating a highly successful corporate liaison program that will serve as a model for the entire IEEE". * Much thanks to Tom Coughlin for being active in the Corporate Liaison Program committee from the start. 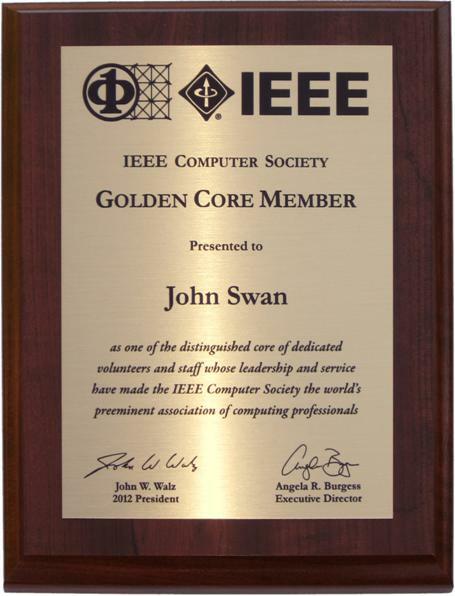 John was Awarded the 2012 Golden Core Award (photo below) from the IEEE Computer Society in January, 2013. This prestigious Award was given to fewer than 30 individuals in 2012 from the 80,000 member Computer Society. 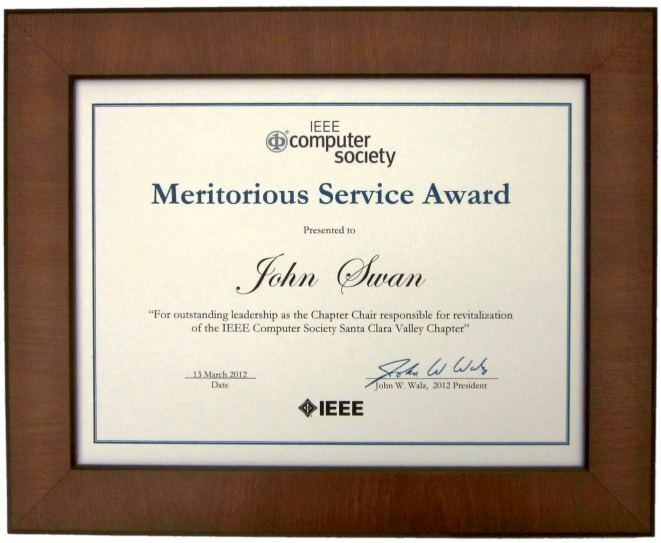 In early 2012 he was awarded the Meritorious Service Award, also from the IEEE Computer Society. (see IEEE-CS article). These awards were for "Outstanding leadership as the Chapter Chair responsible for revitalization of the IEEE Computer Society Santa Clara Valley Chapter." For more information, see John's LinkedIn Profile. 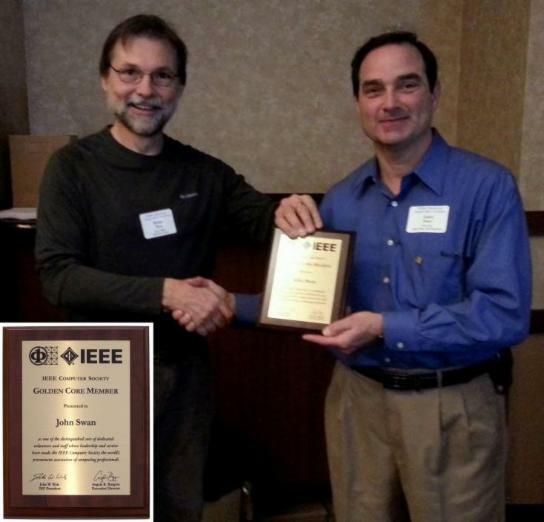 Photo: Brian Berg (left), 2012 Chair of the IEEE Santa Clara Valley Section is presenting John with the Golden Core plaque at the Section's annual IEEE Training. 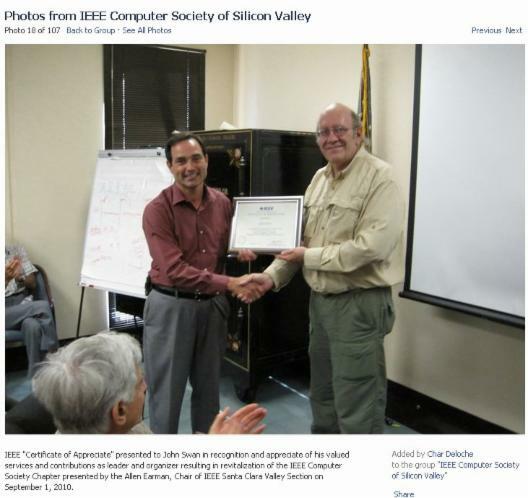 Below, John receives a Certificate of Appreciation from Allen Earman, Chair of the Santa Clara Valley Section, in 2010 as local recognition for his efforts in revitalizing the Computer Society Chapter. This photo was posted to the Chapter's Facebook Group.